Well we have been in Ubud for about 16 months now and a few weeks ago we decided that we might like to take off for a bit! I love our life here, but there are things that I am missing from the Western World (clear roads and footpaths for a start) so we have decided to take a break from life in Paradise and head to Europe for a few months to travel around and see what there is to see. We sub-let our house to some friends from an online group we are part of, suspended both the kids schools for a semester and less than 30 days from deciding to take off here we are on the eve of our departure. 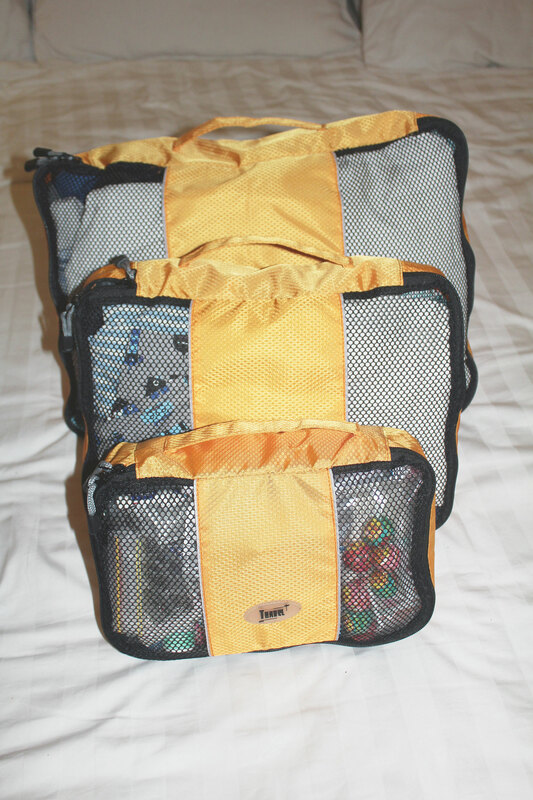 Our plan is to pack light and travel easily. We used to travel like this, then we had kids and 40kgs worth of luggage became the bare minimum. However, I have recently come across what might just be the best thing in travel since sliced bread. Packing Cubes? Haven’t heard of them … neither had I until I read about them on another friends blog! I ordered some online and honestly can’t stop raving about them. We got two sets (orange and green), each set has a small, medium and large packing cube which are all used for different things. For example. I have the large, green packing cube for my clothes and Scott has the orange one. The boys both have a medium one each and then the two little ones hold ALL our little miscellabous bits and pieces that usually float around our suitcase that we can never find. 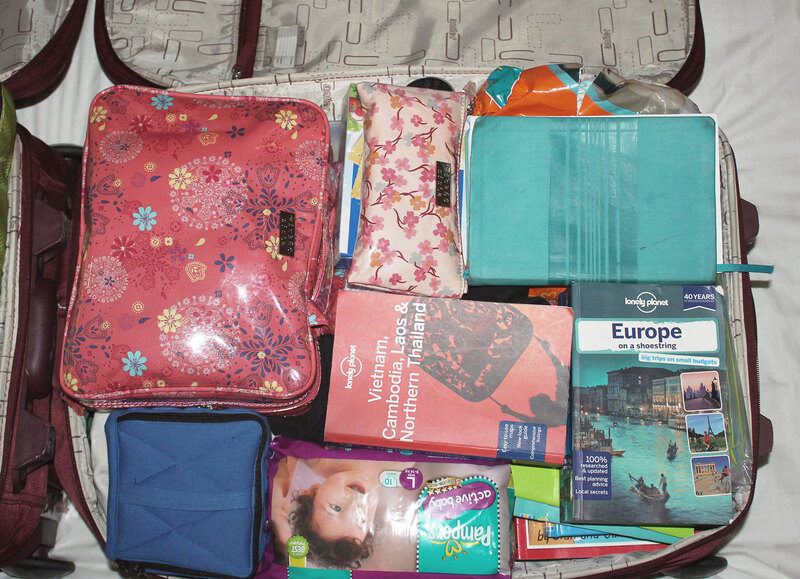 It has revolutionised the way I pack. I even packed our 4 clothing cubes all in the same way (t-shirts in the same spot, undies in the same spot etc). Here is a photo of one set. Here you can see how well they fit together in our suitcase. The two big ones are on the bottom and the ones you can see are two mediums and one small. The other small goes in the 2nd suitcase with all our other stuff! 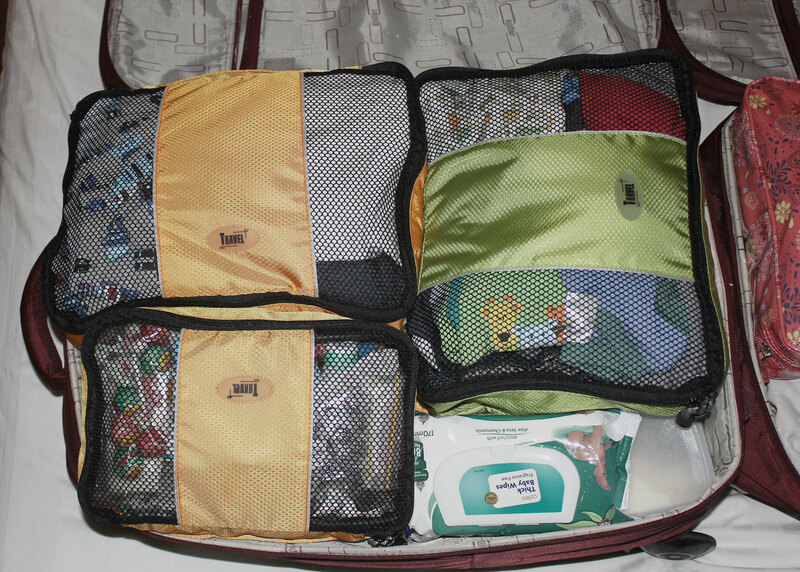 Here is the second suitcase … just so you can have a stickybeak! We are very lightweight and whilst I have thrown in a few unnecessary items (like extra nappies and wipes, a few books/magazines and some workbooks for Tom) it is really just because we have loads of excess weight and we can shed these items as we go. I did a trial run a few days ago and packed EVERYTHING that we needed and we managed to get it into the two medium suitcase, weighing in at 27kgs. So we have added a few disposable things that we can use and then pass on or throw away as we go. 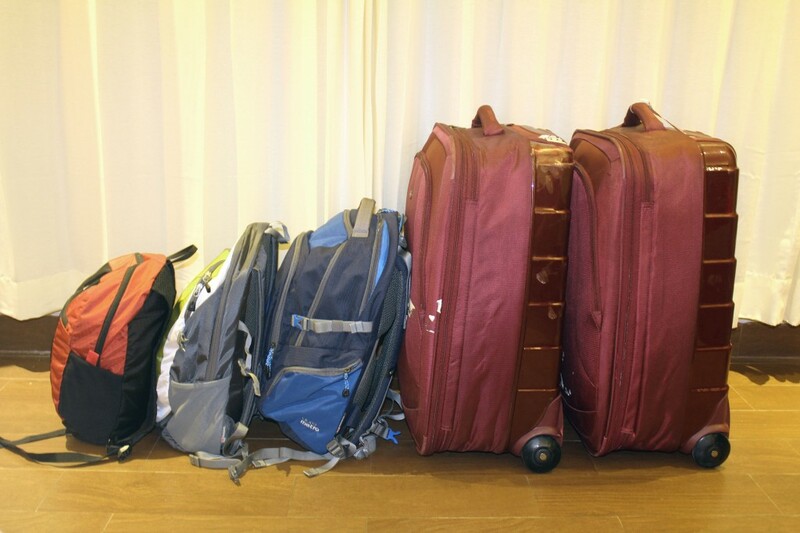 Now it is all sitting at around 35kgs (not including the backpacks) which is pretty awesome! Our backpacks are pretty simple. The little one is for Tom and Milo and for Tom to carry. It is pretty lightweight, when it is empty it rolls into a ball that is about the size of a small camera and it is super comfy to carry. It is just for their toys. They have two soft, cuddly toys each, some lego, cars, trucks and plastic animals/dinosaurs/army figurines! The Medium one is mine and that is to be our daypack. It is like a large but comfortable handbag/baby bag. Hopefully it will be pretty light most of the time! The big one is Scott’s and is for all our technology. We leave at 7am tomorrow morning. Our first stop is Angkor Wat in Cambodia. I can’t wait. It has been a dream of mine for years and here we finally are! As always I am hoping to update my blog as we go (I really think it might happen this time LOL) and would love to hear from anyone as we go! You guys are going to have so much fun! And YAY for packing cubes. We love them too! I’m thrilled for your family and the new adventures that will abound. Tom is going to revel in them! Enjoy your travels, be refreshed, eat amazing pastries, listen to the hum of car wheels on smooth roads, breathe in the sweet smell of summer flowers in Europe and come visit Ubud again. See you later in the year. Thanks so much! Tom is already having an amazing adventure and really enjoying seeing new things! We will miss you all so much! See you soon! Ok Jen I am inspired! Looking forward to those posts and to hearing about things first hand when you return! Thanks hon. We are super excited. I personally can’t wait to get to the land of fast internet (I know you might be able to relate LOL) Looking forward to catching up when we get back! Have fun on your trip and please keep us updated in the House Sitting World FB group. Thanks for your message. I can totally recommend the packing cubes. We also have a few little bags (like your Clarin’s bag) which are great for medical kits and little bits and pieces. We are 4 days into our trip and I still know where all our clothes are. They cubes are still neat and tidy and it has been so easy to find things! Our housesit starts on Saturday so I’ll let you know how it goes!